“Well, let’s suppose you starve to death and die down there. 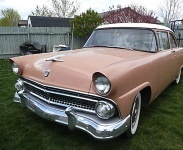 The ugly, Salmon colored 1955 Ford pushed it’s way southward into the cool October breeze. The clutch slipped a little and the 6 cylinder engine wasn’t making happy noises. That was normal for it though. This was only my third day as a full-time evangelist. Now, it really is kind of funny that I would have considered myself full-time, because I did not have any revivals scheduled, or any invitations. I did not have an exact destination either. I was driving not knowing literally where I was going. I was having an “Abraham” type moment. Several weeks prior, I had sat in our living room talking with my parents. My Father, Carl Ballestero pastored Christ Temple Apostolic Church in South Bend, IN. He had given me permission to go “on the evangelist field” and I was thrilled with the open door. Mother asked, when I had thought about leaving? I was sure I would be ready to go in two weeks. “Where are you going?” she had asked. “Louisiana!” I had responded, not knowing really why. “Do you have any revivals scheduled?” she pushed. “And I won’t ask for one either.” I said. “The same God that helped you and Daddy when you evangelized, will help me too.” There, I had said what I felt. It had just felt good to say that. I could only hope He would. The year was 1963. I had just quit my job making $1.25 an hour. I had only saved $85.00. That took several weeks for me. But I was confident I could last a while on that. Dad had offered me the use of a gas credit card. I turned him down. He got very serious and said, “Here is one we don’t use. It’s a DX card. Whatever you charge, you’ll have one month to pay for it.” I took it because I saw he really thought I should. I was 19 and had only preached one revival. It had been a one-week Youth Revival in a Buchanan, MI, a neighboring church. I had been invited to preach Youth Services occasionally at other churches since I was 16. Dad and Mom had prayed for me as I was preparing to go, we all had hugged necks and kissed and then I left. Momma cried. Now I sat watching the road while my heart kept sinking lower and lower. I had used Dad’s DX card for gas. The last two nights I had slept in my car and washed up in the truck stops. It had been easy to blow $5.00 on Dr. Peppers, Moon Pies and Frito’s. They had been my main food source for two days. The muffler and tailpipe had fallen off at Eldorado, AR. By the time I pulled into Leesville, LA, my alternator and generator had quit, the distributor cap was cracked and the carburetor needed a kit installed. I could not go on. The service station guy said he would install used parts for me if I got them. I went to the junkyard and bought what I needed. The parts and the labor came to $75.00. I now had a grand total of $5.00 to my name and I was over a 1,000 miles from home. A nearby Bank caught my eye. I walked inside and laid my last bill down. “I would like $4.00 in quarters and the rest in nickels and dimes.” I told the teller. With my handful of change, I went to the closest phone booth. Too proud to ask for help or call collect, I was determined to pay for this call. “Please deposit $3.50,” the operator’s voice instructed me. I did, counting carefully under my breath. When my Father answered, words hurriedly rolled from my lips. “Daddy, I don’t want you to know where I’m at because I don’t want you to send me any money. I just have a question for you. I told him of my mechanical misfortunes and that as of right now, I only had $1.50, I didn’t know what I was going to do about supper, where I was going to sleep tonight, or how I was going to get a revival. “All I want to know is what do you do now?” that was my question. My ears heard laughter. I listened in disbelief. I couldn’t see any humor in the situation. “I’m sorry, but I don’t see much humor here Daddy,” was about all I could manage to say. “Well, let’s suppose you starve to death and die down there. If you do, I will build you a monument bigger that George Washington’s,” was his reply. Then he laughed some more. Still held in a serious mood, I could not see anything funny in our conversation. “Why would you build me a monument bigger than George Washington’s if I starve to death and die,” I wanted to know. “The reason I’ll build you a monument bigger than George Washington’s if you starve to death and die, will be because you will have been the first man God ever let down.” he said. “Oh Daddy! Thank You!! I love and I’m so sorry to have called and bothered you! Good bye!” And with that, I hurriedly hung up the phone. I knelt on the floor in that old phone booth. It was located on the south side of town beside highway US-171 that runs southward towards Lake Charles. “Lord, if you’ll forgive me for doubting you, I’ll not do that any more.” I said the words with tears running down my cheeks. To this day I can smell the pine from the logging trucks and hear their engines in my ears as one after another they vibrated my phone booth during my prayer. When I walked out, I was shocked to run into a familiar face. Pastor Cranford from Sulphur, LA. He had attended my Dad’s Open Bible Conference in March. “What are you doing here?” he wanted to know. “I’m starting out evangelizing,” was all I could say. “Have you had supper?” was his next question. “Mama’s got a big pot of gumbo on, come home with me.” He invited. While I ate, what just happened to be, one of the best meals of my life, Bro. Cranford asked if I could preach at the Youth Service that night. After church he called Bro. A.L. O’Brien in Starks. Bro. O’Brien invited me to come to his church. I preached to the youth before church every night before their revival service. The church was in a revival with C.R. Free. I lived in the O’Brien’s home for almost 9 weeks of that revival. Bro. O’Brien told me that there was a little place down the road called Lunita. A Bro. Kirkland was the pastor and he wanted me to come. I preached 9 nights there, and 16 backsliders prayed through. Bro. C.W. Shew sent a message to Bro. O’Brien inviting me to come to Ft. Worth, TX. for a revival. In all, I was gone 9 months before I returned home. Then it was just long enough to trade cars and go back to the next revival. This year marks my 50th year of preaching. In that time I have been blessed to have preached over 900 revivals or series of services, besides conferences, camps and anniversaries. The first thing God had to teach me, was actually the first thing he had to teach Israel when then came out of Egypt. My Father taught me one of the most important lessons of my life. Thanks Dad! Wonderful story! Thanks for sharing. I’m going through something now and reading the passage “you will be the first man God has ever let down” was just what I needed to hear. God bless you! I’m so thankful you shared this story…it feels good to be reminded once again of God’s faithfulness! We love & appreciate you & Sis B and your precious families! Wow! Isn’t it amazing when God lets you know he know just where you are at. Thank you so much for sharing this with us. My family so needed it. I really enjoy your blogs. One of the good things about the internet. 🙂 Lord Bless. Thank you! Love you and Mom Dearly!! It didn’t matter how many times I had heard the story before, reading it just now made me laugh & cry. I can just see Daddy’s face as you would tell the story & he would just grin. Oh, but I miss him. I do agree w/Bro Davis insomuch that you tell a story like Dad. What a gift you have!!! Love you!! life! I love the testimonies of God’s Faithfulness! So glad he hasn’t changed or ‘went out of business’! old car when you had it and now they are classics! I have tears in my eyes and joy in my heart from reading it! Bro. Ballestero, I read and subscribe to your writings! I can not tell you how influental they are in my life and Walk! Thank you! I have read and re-read this one and had to come back tonight and read it again! Personally, I like this one the “best” because it truly shows that His hand is upon us, even though we doubt. Thank you for your Ministry!! !